‘City Of Thieves‘ is a rare book, one that fires on all cylinders and almost never missteps. It’s a modern textbook example of how to write a great novel. Stories often have their strengths and their weaknesses when all is said and done. They can rely more on character than plot, or vice versa. A story might be strong, but pacing is a problem. Dialogue might come off unrealistic, although narrative hits the mark. In short, most books are a balancing act. There are things done right, and things that could have been better. Benioff’s third offering is perfectly balanced. There are no pros and cons, no strengths to rely on. The entire work is solid from beginning to end. This is a damn-near perfect novel and Benioff is a damn-near perfect storyteller. That’s pretty much all you need to know. 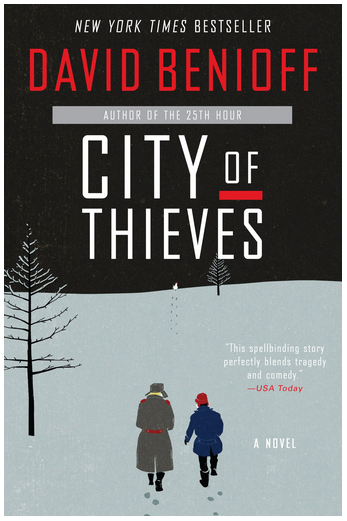 Set in Leningrad during WWII, ‘City Of Thieves’ is a hard look at the best and worst of humanity, often hilarious and harrowing at the same time. To say any more would be to give it away, but City Of Thieves should be required reading for every fan of fiction. Darkness and light entwine in these pages, opening your eyes and affecting your heart. And although it’s fiction, it is based on historical fact. Just knowing this type of tale occurred in the real world is enough wind you. You’ll laugh, you’ll gasp, you might even cry. This is one book that will play on your mind long after you’ve put it down. I couldn’t recommend it enough. *This book was one of my ‘10 Books That Stuck With Me‘ piece.